Many years ago I worked as a bellman and airport shuttle driver for a hotel. My duties included the usual carrying of bags and shuttling people to and from the airport as well as various mundane tasks like straightening the brochure racks, helping to prep for banquets and prepping and restocking the swimming pool area before the pool opened in the morning. One morning, around 5:30am to 6am, while out organizing chaise lounges and stacking towels I saw a woman, a guest of the hotel, crouching down and crawling through the hedges that served to block the guestroom patios from the main courtyard. She was acting pretty erratic and seemed oblivious of me. Resort goers seldom rise before 6am unless it is their time to head of to the airport, and this is the only time I had ever seen one in the underbrush. As usual I approached and asked if there was anything I could assist with. A lady in her early 50’s who looked as if she had just thrown on some clothes to trapise through the bushes, stood up and said no, she was just busy catching lizards. 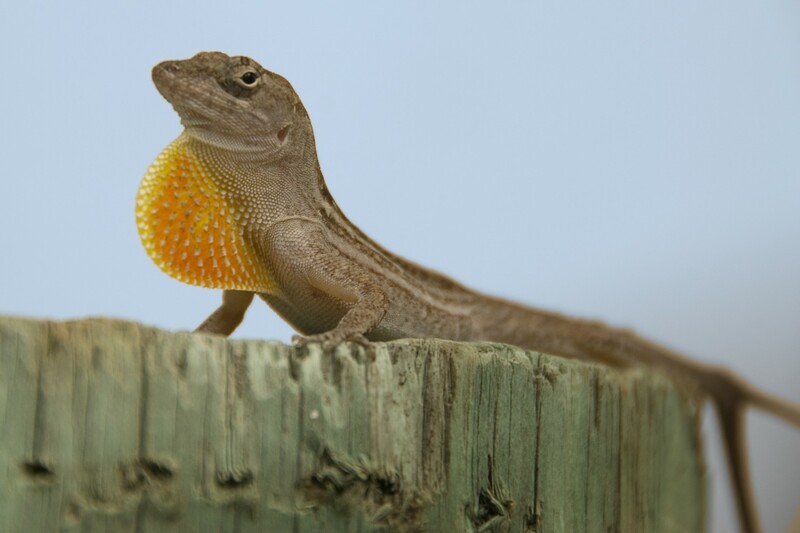 A happy anole showing off his dewlap for the ladies. Later that day I was called to drive a guest to the airport. That guest was my morning lizard catcher. Along the way I learned that she was from somewhere up north, sadly I forget where, but somewhere cold enough to not have a lizard population. She thought our lizards were fascinating! While she was on vacation, by herself, the “old lady who lives next door” was watching her house. Logically, since they didn’t have lizards at her house, she was going to mail some home. I drove her to the airport post office, she went inside and mailed her package, I drove her back to the hotel. She either rented a car or flew home, leaving the hotel during sometime else’s shift, because I never saw her again. Mind you that this was before cell phones and long distance calls from hotels was highway robbery as hotels routinely charged double or triple the standard rates for calls, often even charging for local calls, which cost the hotel nothing. Endless speculation has only given me two scenarios. A package with Florida lizards was on its way north to the home of an old lady who, probably, was not expecting it. The U.S. Mail is sometimes fast, sometimes slow; some mail is sent ground, some air. This gives a chance for the lizards to arrive live or dead depending on the shipping. I’m sure you see where this is going. The old lady either receives a box of dead lizards or a box of live lizards. I don’t know which is worse. Either one would simply defy explanation. I have told this story many times over the years and it never ceases to make me laugh. Perhaps it is better that I never found out. In my head the old lady both screams and drops the box while hungry lizards leap to freedom and she stares disbelieving into a box containing several lizard carcasses wondering if the mafia has gone low budget. hotels, lizards, people, true stories. Bookmark.